The arts, crafts and modellers boxed set contains 3 different handles and 13 precision ground carbon steel blades. No.1 handle fits ACM blades nos. 7, 10, 11, 16 and 17. No.2 and No.5 handles fit ACM blades 2, 18, 22, 24 and 28. 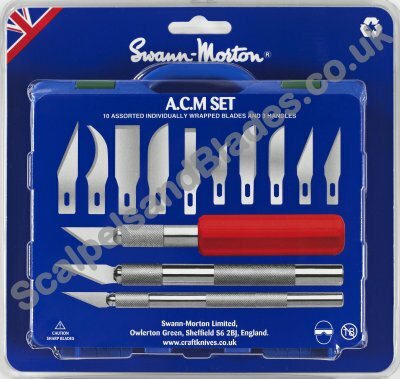 A pack of 5 Guards to fit the Swann Morton ACM No1 Handle The Handle and Blade in photo are not included in this price. A pack of 4 Guards to fit the Swann Morton ACM No2 or No5 Handle The Handle and Blade in photo are not included in this price. ACM No.1 Handle with 1 x No.11 blade carded Overall length 146 mm with No 11 blade fitted. We also offer 4 x ACM No1 Handles with no Blades. Overall length 121 mm without Blade x 7.9mm diameter. All measurements are for guidance only.